"Usonian" redirects here. For the alternative name for a United States citizen, see Names for United States citizens § Alternative terms. Usonia (/juːˈsoʊniə/) was a word used by American architect Frank Lloyd Wright to refer to his vision for the landscape of the United States, including the planning of cities and the architecture of buildings. 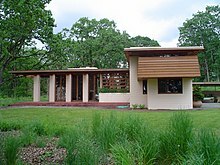 Wright proposed the use of the adjective Usonian in place of American to describe the particular New World character of the American landscape as distinct and free of previous architectural conventions. "Usonian" usually refers to a group of approximately sixty middle-income family homes designed by Frank Lloyd Wright beginning in 1934 with the Willey House, with most considering the Herbert and Katherine Jacobs First House, 1937, to be the first true "Usonian." 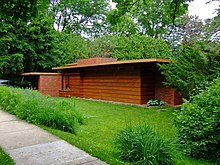 The "Usonian Homes" are typically small, single-story dwellings without a garage or much storage. They are often L-shaped to fit around a garden terrace on unusual and inexpensive sites. They are characterized by native materials; flat roofs and large cantilevered overhangs for passive solar heating and natural cooling; natural lighting with clerestory windows; and radiant-floor heating. Another distintive feature is that they typically have little exposure to the front/'public' side, while the rear/'private' sides are completly open to the outside. 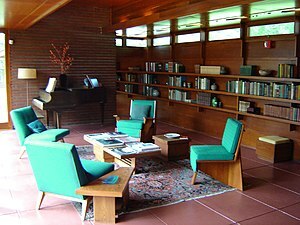 A strong visual connection between the interior and exterior spaces is an important characteristic of all Usonian homes. The word carport was coined by Wright to describe an overhang for sheltering a parked vehicle. The Usonia Historic District is a planned community in Pleasantville, New York built in the 1950s following this concept. Wright designed 3 of the 47 homes himself. Variants of the Jacobs House design are still in existence today. The Usonian design is considered among the aesthetic origins of the ranch-style house popular in the American west of the 1950s. In 2013, Florida Southern College constructed the 13th Wright building on their campus according to plans that he created in 1939. The 1,700 sq. ft. building includes textile-block construction, colored glass in perforated concrete blocks, Wright photographs, a documentary film about the architect's work at the school, and furniture designed by Wright. Named the "Usonian House", it was originally designed as one of twenty faculty housing units. The building is home to the Sharp Family Tourism and Education Center, a visitor center for guests visiting campus to see the collection of Frank Lloyd Wright buildings. But why this term "America" has become representative as the name of these United States at home and abroad is past recall. Samuel Butler fitted us with a good name. He called us Usonians, and our Nation of combined States, Usonia. —  Frank Lloyd Wright on Architecture: Selected Writings 1894–1940, p. 100. However, this seems to be a misattribution, as there is as yet no published evidence that Butler ever used the word. based upon the "Fundamento," the Esperanto literature, and the national-Esperanto dictionaries bearing Dr. Zamenhof's "aprobo"
José F. Buscaglia-Salgado reclaims the term Usonian to refer to the peoples, national ideology and neo-imperial tradition of the United States of America. Miguel Torres-Castro uses the term Usonian to refer to the origin of the Atlantic Puffin bird used in the children's book Jupu the Puffin: A Usonian Story. The bird is a puffin from Maine, USA. The Malcolm Willey House; view of garage/entry steps. Hanna–Honeycomb House, view of front exterior. Goetsch–Winckler House, exterior, view of carport & entry. View of the rear/private side of the Laurent House. This house is a "hemicycle" Usonian, rather than the more typical L-shaped variants. It is also the only house Wright designed for a physically disabled client. Street-side view of the Rosenbaum House. The two, long cantilevered roofs pictured are a signature feature of Usonian houses, and serve to emphasize the horizantal. ^ "About - The Willey House". ^ James D. Law, Here and There in Two Hemispheres (Lancaster: Home Publishing Co., 1903), pp. 111–12n. ^ Buscaglia-Salgado, José F. (2003). Undoing Empire, Race, and Nation in the Mulatto Caribbean. Minneapolis: University of Minnesota Press. ISBN 0-8166-3574-9. ^ Torres-Castro, Miguel (2014). Jupu the Puffin: A Usonian Story. New York City: Jupu Press. ISBN 0-6159-4073-0. Look up Usonian in Wiktionary, the free dictionary.